A bicycle has been found near you. Visit nixle.com for details and to report tips. 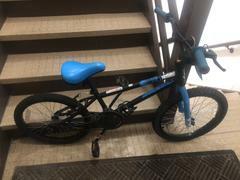 The Burlington Township Police Department found a boys BMX style Diamond Back bicycle that is black and blue in color. The bicycle was found in Walnut Park. If this bicycle belongs to you or if you know who the bicycle belongs to please contact P/O S. Cosmo at either (609) 386-2019 or scosmo99@burltwppd.com.